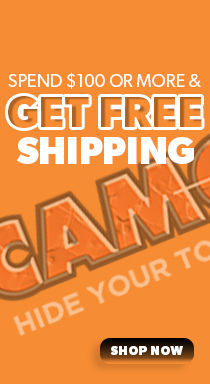 Orders of $50 or more, Camowraps® is offering FREE shipping to customers in the contiguous United States. Any questions or inquiries please feel free to contact us. Wildlife Decals - Contour-Cut Duck Flock Decal. (2) 6” x 8” decal. Mild Soap & Water Mixture, Window Cleaner or Alcohol - to clean the surface. Lint Free Paper Towel or Cloth – to dry the surface. Air Release Tool – to remove any trapped air bubbles that may form. The first step in any successful application is cleaning your Camowraps® Project before Installation. Clean outside of window thoroughly with Window Cleaner, Isopropyl Alcohol or a Mild Soap and Water solution. Use Lint-Free Towels to dry surface and remove any excess liquid or dirt around edges. Make sure all stickers are removed from the decal area. Once the Glass Area is Clean and Dry, you can apply the Camowraps® Window Decal. Clean & Dry Application Area. Position Decal in desired location and secure with tape. Carefully peel backing from back of decal. Firmly smooth decal on surface using squeegee or credit card. All Decals have a clear masking on top to assist in the installation of the Decal, carefully remove from front of decal. Avoid using High Pressure washing or brushes around Decal area. CAMOUFLAGE CARE TIPS: Use soap and water to clean graphics. Do Not use a pressure washer on graphics as this can cause them to rip and peel away. Do Not wax the graphics; it will only cause damage to them. HOW TO REMOVE: Heat the Decal with Heat gun or Hair Dryer for several seconds and continue to heat as you peel the material from the surface on a 120° angle. Any residue can be removed with a Citrus Based remover or Alcohol. 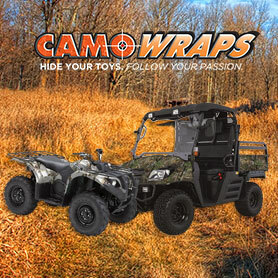 Camowraps is committed to providing quality products that are sure to surpass expectations. However, if you are unsatisfied with your purchase, you can exchange or return your undamaged, uninstalled graphic within 90 days of delivery. After 30 days of delivery, products will be subject to a restocking fee. To obtain your refund/exchange, please contact our customer service department at 1-866-226-6626. Return items should be in their original packaging, include all packing materials and receipt. If you received an item containing defects, please contact customer service at 1-866-226-6626.